Welcome to the first 2018 edition of the IPC-IG’s Inclusive Growth Bulletin. We are glad to present a selection of studies regarding growth and inequality in Brazil and publications summarising the main debates from the recent International Seminar on Climate Change and National Accounting. We also bring you the latest news and updates regarding the Centre’s activities. 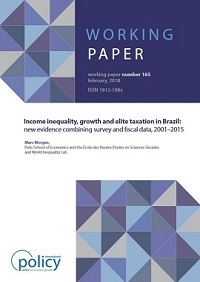 In the Working Paper “Income inequality, growth and elite taxation in Brazil: new evidence combining survey and fiscal data, 2001–2015”, Marc Morgan (Paris School of Economics, École des Hautes Études en Sciences Sociales and World Inequality Lab) analyses the pre-tax inequality in the income that individuals receive in the country and the role of the personal income tax in regulating these incomes. This paper exploits three sources of data to arrive at the estimates of income shares across the entire distribution in Brazil: the Pesquisa Nacional por Amostra de Domicílios (PNAD), the large, nationally representative household survey organised by Brazil’s National Statistical Bureau (Instituto Brasileiro de Geografia e Estatística —IBGE). This publication is available in English, and an accompanying One Pager is available in English and in Portuguese. We also bring you the final two One Pagers of a five-part series, produced in partnership with the Institute for Applied Economic Research (Ipea), summarising the themes discussed during the International Seminar on Climate Change and National Accounting. 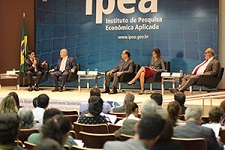 This seminar, jointly organised by the IPC-IG, Ipea, the Institute for Climate and Society (ICS) and the Brazilian Government this past October, addressed the challenges and opportunities involved in including measurements of greenhouse gas emissions in the System of National Accounts. (Read the event’s full report here). The One Pager “A project towards bridging tables between national accounts and emissions” outlines the debate around the challenges and opportunities in establishing GHG emissions accounts in Brazil, in light of international experiences. This publication is available in English and in Portuguese. Finally, the One Pager “Environment account challenges and the way forward” recaps a panel discussion between specialists regarding their perception of issues raised during the seminar, including the methods of production of information in Brazil and how this relates to making climate change assessments compatible with national accounts. This publication is available in English and in Portuguese. The One Pager “From policy commitments to the effective implementation of gender-sensitive social protection programmes”, by Charlotte Bilo and Raquel Tebaldi (IPC-IG) and Maja Gavrilovic (Food and Agriculture Organization of the United Nations—FAO), is now available in French and in Spanish. It was previously released in English and in Portuguese. In addition, the One Pager “Human development and land tenure in Brazil”, by Alexandre Arbex Valadares, (Ipea), Fernando Gaiger Silveira (Ipea and IPC-IG), and Nikolas de Camargo Pirani (United Nations Development Programme—UNDP), is now available in Spanish. It was previously released in English and in Portuguese. Our colleagues and partners at the socialprotection.org online platform will host the webinar Social accountability in the delivery of social protection: exploration of approaches and principles, on 1 March. Jointly organised by the IPC-IG and HelpAge International, this is the second webinar in a three-part series. It will explore different approaches and the design principles which strengthen the social accountability, sustainability and scaling up of social protection programmes, among other topics. Register for free here and visit the platform to learn more about upcoming webinars. 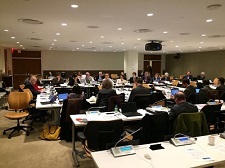 The IPC-IG joined fellow colleagues of the global social protection community at the 10th Social Protection Inter-Agency Cooperation Board (SPIAC-B) meeting, held at the United Nations Headquarters in New York, on 1 February. Our Senior Project Officer, Mariana Balboni, presented the main results of socialprotection.org, the activities facilitated by the platform in support of social protection initiatives around the globe, and the Transform e-learning project, in collaboration with the International Labour Organization (ILO) and the EU Social Protection Systems Programme (EU-SPS). We invite you to register at socialprotection.org and join our global community of social protection practitioners. On 1 February, the IPC-IG organised a seminar on the Sustainable Development Goals (SDGs) and the Challenges for Water and Sanitation Management in Brazil, in partnership with the National Water Agency (ANA), the UNDP and Ipea. The main purpose of the event was to gather contributions from leading water and sanitation experts regarding the implementation of the UN Sustainable Development Goal no. 6: “Ensure availability and sustainable management of water and sanitation for all”. The seminar was attended by renowned Brazilian and international experts, public managers, researchers, and representatives from the private sector, non-governmental organisations and civil society, to discuss the inseparable relationship between water, the environment and sustainable development. This was the first in a series of three seminars to be organised by the IPC-IG and its partners in 2018. The IPC-IG research team travelled Maputo and Tete, in Mozambique, from 12 to 16 February, as part of an inception mission for two research projects in partnership with the World Food Programme (WFP). 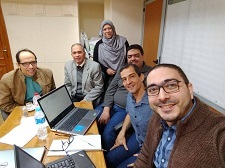 The first project aims to assess the coverage of food fortification initiatives in the country, while the second one will evaluate the impact of a set of WFP interventions to facilitate market access for members of 14 smallholder farmers’ organisations. In the capital, Maputo, our Senior Research Coordinator Diana Sawyer and Research Associates Alexander Cambraia and Wesley Silva met with representatives from FAO, the Inter-American Institute for Cooperation on Agriculture (IICA), the WFP and the EU, to gather general information regarding the implementation of the two projects. They also attended meetings with officials from the National Institute of Statistics (Instituto Nacional de Estatística - INE). In Tete, IPC-IG consultants Sofie Olsson and Elsa Maguduanea, and research intern Vinicius Nogueira met with smallholder farmers’ organisations to better understand the local agricultural context. The vital information gathered in these visits will be used by the IPC-IG in designing a national food fortification coverage survey and an impact evaluation study for the market access intervention. 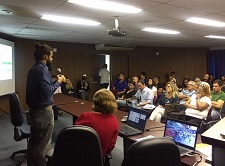 On 31 January, the IPC-IG research team presented the methodology used in the baseline study on the Targets of the Nike Project for 22 Olympic Villages in the city of Rio de Janeiro.Nike invited IPC-IG Researchers Mariana Hoffmann, Solange Ledi Gonçalves and Wesley J. Silva to discuss indicators with partners such as officers from the Rio de Janeiros's Municipal Subsecretariat for Sports and Leisure (SUBEL), managers of the Olympic Villages and Nike representatives. The project seeks to promote sports and physical activities for children at the 22 Olympic Villages, located in low-income communities and managed by the Municipal Government of Rio de Janeiro. The role of the IPC-IG is to support the monitoring and evaluation of the project through data analysis and the development of indicators. Under the scope of an ongoing research project undertaken by the IPC-IG and UNICEF Egypt, our Senior Research Coordinator, Rafael Guerreiro Osorio, travelled to Cairo from 8 to 12 January to review and enhance the child sensitivity and focus of the monitoring and evaluation (M&E) systems of the country’s Takafol and Karama cash transfer programmes. During the mission, he met with officials from the local government and UNICEF to present a proposal for the development of a tool to be used in the M&E of these projects.